A couple of months ago I randomly came across a blog by MathaAfterHours with loads of knitted Christmas balls and I fell in love with them instantaneously. As it happens, one usually start (re)searching one thing and then the next comes along, the search spreading in a web-like fashion. Starting off from said balls, I became fascinated by Icelandic Lopi, northern knits, down to colourwork, Norwegian knitting and finally Fair Isle. I bought a lot of sample wool because I was curious about the yarn, its feel and also because it looked so “right” – you know, not the neat look that many of the commercial yarns have. And I loved that many of those yarns were produced on a smaller scale, possibly locally or in traditional mills. Purchasing the product is not just a matter of beautiful knitting, but it can also help support the local, small-scale economy and preserve valuable skills and traditions. There is such a beauty in those Nordic patterns, that all you want to do is try them! 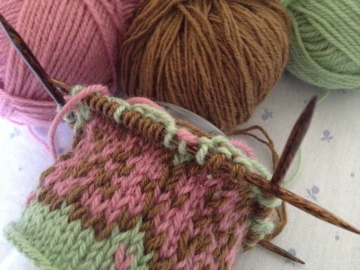 To make things a little more difficult, the size of the swatches was too small to be knitted in the round on my circular 40cm needles, so I had to use (my first time) some beautiful Laurel Hill DPNs that I had received on my birthday. I made a couple of swatches, one in two colours and the other in three – work proceeded slowly but it was exciting. The first was a traditional Fair Isle pattern from one of the books I bought, the other was a pattern I created myself after being inspired by some Donegal fabric I had seen. Pictures to follow in future posts – I’m still pondering and working on some small “patterns”, I mean, just for fun, no serious proper stuff! 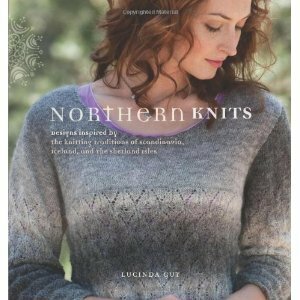 Northern Knits by Lucinda Guy: modern designs inspired by the knitting traditions of Scandinavia, Iceland and the Shetlands. Beautiful colours and patterns, I found in it many small and larger projects that I’d love to try one day. The sweater on the front cover is stunning. 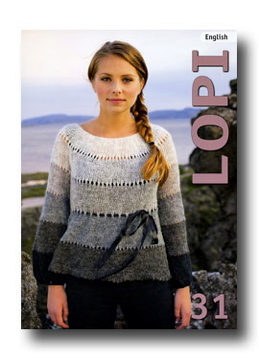 Lopi by Istex is an Icelandic collection book that is published on a regular basis and also comes in an English edition. 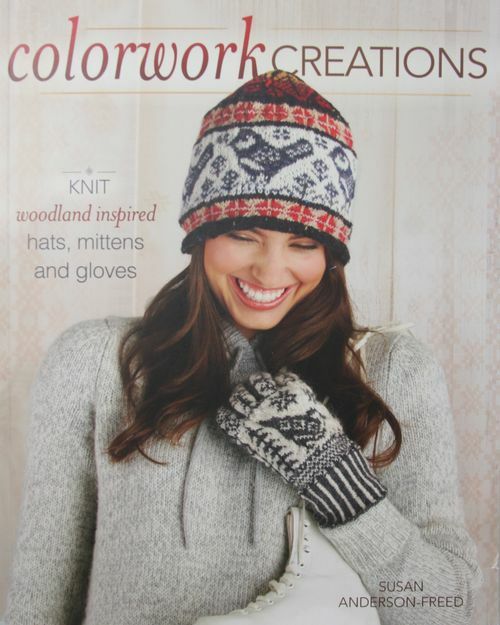 It reinterprets traditional Icelandic patterns with a modern twist; the lace sweaters, see the one on the cover, are fabulous. 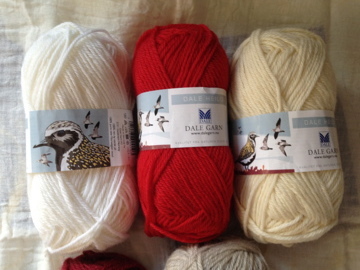 You can find it through the UK distributors, I got mine from Carreg Yarns, an Icelandic wool specialist. 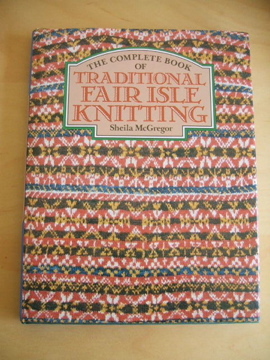 The Complete Book of Traditional Fair Isle Knitting by Sheila McGregor is a classic book that in three parts tells about this style, from its background and origins to design and techniques and concludes with a comprehensive overview of patterns. It is a very good reference book. 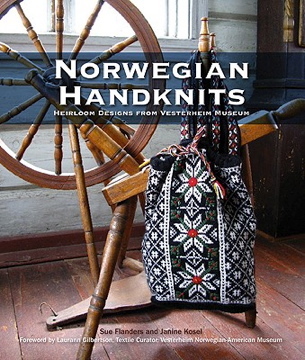 Norwegian Handknits by Sue Flanders and Janine Kosel offers a collection of modern takes on heirloom designs from the Vesterheim Museum. The items are attractive and use traditional colour schemes. Very beautiful accessories and garments, in various project sizes. Colorwork Creations by Susan Anderson-Freed presents accessory ideas using the colorwork technique. Well laid out, each section starts with presenting the basic pattern, followed by single projects, each with photo, colour charts as well as various information. Attractive motifs and beautiful colour ranges. Of course, there are plenty more sources! The above is a only small selection and the choice criteria for my purchase was based on beauty of the patterns and reasonable price of the book. And what books do you use as a reference for your works (if any)?